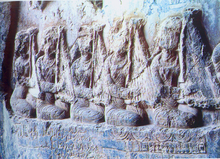 Chang players depicted on a 6th-century Sasanian relief at Taq-e Bostan. The reign of Sasanian ruler Khosrow II is regarded as a "golden age" for Iranian music. He is shown among his musicians on a large relief at the archaeological site of Taq-e Bostan, holding a bow and arrows himself and standing in a boat amidst a group of harpists. The relief depicts two boats that are shown at "two successive moments within the same panel". The court of Khosrow II hosted a number of prominent musicians, including Azad, Bamshad, Barbad, Nagisa, Ramtin, and Sarkash. Among these attested names, Barbad is remembered in many documents and has been named as remarkably high skilled. He was a poet-musician who performed on occasions such as state banquets and the festivals of Nowruz and Mehrgan. He may have invented the lute and the musical tradition that was to transform into the forms of dastgah and maqam. He has been credited to have organized a musical system consisting of seven "royal modes" (xosrovāni), 30 derived modes (navā), and 360 melodies (dāstān). These numbers are in accordance with the number of days in a week, month, and year in the Sasanian calendar. The theories these modal systems were based on are not known. However, writers of later periods have left a list of these modes and melodies. Some of them are named after epic figures, such as Kin-e Iraj ("Vengeance of Iraj"), Kin-e Siāvaš ("Vengeance of Siavash"), and Taxt-e Ardašir ("Throne of Ardashir"), some are named in honor of the Sasanian royal court, such as Bāğ-e Širin ("Garden of Shirin"), Bāğ-e Šahryār ("Garden of the Sovereign"), and Haft Ganj ("Seven Treasures"), and some are named after nature, such as Rowšan Čerāğ ("Bright Light"). The academic classical music of Iran, in addition to preserving melody types that are often attributed to Sasanian musicians, is based on the theories of sonic aesthetics as expounded by the likes of Iranian musical theorists in the early centuries of after the Muslim conquest of the Sasanian Empire, most notably Avicenna, Farabi, Qotb-ed-Din Shirazi, and Safi-ed-Din Urmawi. Two prominent Iranian musicians who lived under reign of the third Arab caliphate were Ebrahim Mawseli and his son Eshaq Mawseli. Zaryab of Baghdad, a student of Eshaq, is credited with having left remarkable influences on Spain's classical Andalusian music. Following the revival of Iranian cultural influences through the arrival of a number of Muslim Iranian dynasties, music became once again "one of the signs of rule". 9th-century Persian poet Rudaki, who lived under the reign of the Samanids, was also a musician and composed songs to his own poems. At the court of the Persianate Ghaznavid dynasty, who ruled Iran between 977 and 1186, 10th-century Persian poet Farrokhi Sistani composed songs together with songster Andalib and tanbur player Buqi. Lute player Mohammad Barbati and songstress Setti Zarrin-kamar also entertained the Ghaznavid rulers at their court. A Persian miniature depicting musicians and dancers at a banquet. The artist is a student of Kamal-ol-molk by the name of Ibrahim Jabbar-beik. 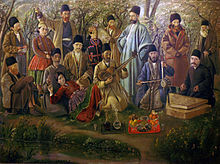 A musical ensemble from the time of Qajar ruler Naser-ed-Din Shah, depicted by Kamal-ol-molk. Ali Rahbari conducting Jeunesse Musicale de Téhéran, in 1974. 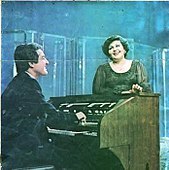 Haydeh and Anoushirvan on the Iranian National Television, in 1975. 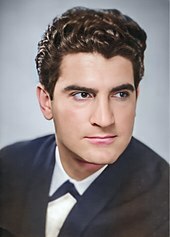 Viguen, Iran's "Sultan" of pop and jazz music. ^ a b c d e f g h i j k "IRAN xi. MUSIC". Encyclopædia Iranica. XIII. March 30, 2012. pp. 474–480. ^ a b c d e f g h Lawergren, Bo (2016). "MUSIC HISTORY". Encyclopaedia Iranica (online ed.). ^ a b c "GŌSĀN". Encyclopædia Iranica. Xi. February 17, 2012. pp. 167–170. ^ Boyle, John Andrew. "Ferdowsī". Encyclopædia Britannica. Retrieved July 18, 2017. ^ "BĀRBAD". Encyclopædia Iranica. III. December 15, 1988. pp. 757–758. ^ a b Farhat, Hormoz (2004). The Dastgah Concept in Persian Music. Cambridge University Press. ISBN 0-521-54206-5. ^ Glassé, Cyril; Smith, Huston (2003). "Ziryāb". The New Encyclopedia of Islam. Rowman Altamira. p. 492. ^ a b "MUSIC HISTORY ii. CA. 650 TO 1370 CE". Encyclopædia Iranica. February 20, 2009. ^ "ʿABDALLĀH, MĪRZĀ". Encyclopædia Iranica (online ed.). January 21, 2014. ^ a b c d e f Saba, Sadeq (November 26, 2003). "Obituary: Vigen Derderian". The Guardian. London. ^ a b c Saba, Sadeq (October 27, 2003). "Iranian pop legend dies at 74". BBC News. BBC News. ^ a b c Armbrust, Walter (2000). Mass Mediations: New Approaches to Popular Culture in the Middle East and Beyond. University of California Press. p. 70. ^ a b c "Rock Rolls Once More in Iran As Hard-Liners Back Pop Revival". The Wall Street Journal. June 2, 2000. Retrieved April 9, 2010. ^ "هفته‌نامهٔ ایرانشهر" [Iranshahr weekly magazine]. 18. Ketab Corp. 2016: 10. ^ "Roll Over, Khomeini! Iran Cultivates A Local Rock Scene, Within Limits". The Washington Post. August 23, 2001. ^ "Iran's underground hip hop dance scene". The FRANCE 24 Observers. August 29, 2013. ^ "'اسکورپیو' در آپارات". BBC Persian (in Persian). September 17, 2015. ^ "Rebels of rap reign in Iran". SFGate. Retrieved October 26, 2015. ^ Anuj Chopra in Tehran (January 28, 2008). "Iran's 'illegal' rappers want cultural revolution". The Independent. ^ BADĪHA-SARĀʾĪ. III. August 22, 2011. pp. 379–380. ^ "Persian Music Center". bia4music. Retrieved 17 August 2018. ^ "Pop Music in Iran". Iran Chamber Society. 2003. ^ "اولین کنسرت جز ایرانیزه شده با سبک تلفیقی بعد از انقلاب در ایران" ["The First Iranized Jazz Concert with a Fusion Style After the Revolution in Iran"]. Musicema (in Persian). November 8, 2010. ^ a b Curiel, Jonathan (September 24, 2013). "Rana Farhan Sings the 'Persian Blues'". KQED Arts. Retrieved March 7, 2015. ^ Smith, Emily Esfahani (August 30, 2011). "Persian Poetry Gets the Blues". The Wall Street Journal. Retrieved April 5, 2018. ^ "Iranian blues and jazz bands find fans in Tehran". Reuters. November 13, 2014. ^ "Pallett Releases 'Endless Ending'". Financial Tribune. March 1, 2017. ^ "Iranians love their klezmer". Public Radio International. February 26, 2016. ^ "'اسکورپیو' در آپارات" ["Eskorpio on Aparat"]. BBC Persian (in Persian). February 27, 2013. ^ "Iran's rock stars and their underground scene". The Guardian. June 4, 2014. ^ "Iranian Metal Band ANGBAND Signs With Germany's PURE STEEL RECORDS". Blabbermouth. Archived from the original on June 12, 2008. Retrieved June 8, 2008. ^ "ANGBAND: New Album Release Date, Track Listing Revealed". Blabbermouth. Retrieved September 16, 2010. ^ "ANGBAND - Three New Songs Streaming". BW&BK. Retrieved September 10, 2012. ^ "Iran's underground hip hop dance scene". France 24. August 29, 2013. Retrieved February 24, 2014. ^ "روزنامه اعتماد ملی 85/6/28 – رپ ایرانی ، صدای اعتراض نیست". Magiran.com. Retrieved June 17, 2015. ^ "French music award goes to Iran artist". Archived from the original on 2016-02-04. Ameneh Youssefzadeh, "Iran’s Regional Musical Traditions in the Twentieth Century: A Historical Overview." Iranian Studies, volume 38, number 3, September 2005. Metapress.com[permanent dead link].